Sometimes you just crave for something tasty and crunchy to munch on. At odd hours of the day, you feel the urge to snack and that urge just does not go away. There is a little noisy craving voice inside you that is bugging you repetitively, and it is so distracting that you just couldn’t stay focused, right? No worries, the all-new Munchy’sNomNom is here to the rescue! 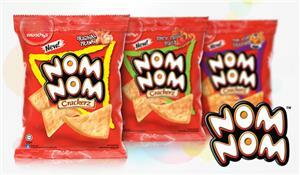 Your all-time favourite keropok is now available in Crispy Crunchy triangular bite size NomNom Crackers, comes in three mouth watering seafood dish-inspired flavours! Unique Triangle Shape – Uniquely shaped triangle bite size NomNom Crackerz gives your tongue a surprise smack of real seafood. Tasty & Crunchy – Absolutely tasty and crunchy. Each crack gives you the ultimate hit of real seafood that one can ever stop cracking with NomNom Crackerz.